Whether it be involving zip wires, boxing gloves or tackling Germans on the football pitch, brazen Boris Johnson’s larger-than-life personality has dominated London politics for the last eight years. It is of course a finely honed thing – a conscious imitation of his rival and predecessor, Ken Livingstone. Boris successfully out-mavericked the maverick and beat him in two successive elections. So with the Mayor stepping down, the Conservatives appeared to try and replicate this successful approach once again. Zac Goldsmith, the likeable Richmond Park MP with a known streak of independence became the maverick they were looking for. But as the campaign runs into its final weeks, the replicated strategy appears not to be replicating its success – Goldsmith trails Labour’s Sadiq Khan by six to ten points, with time running out to turn things around. In part, this appears to be about Zac just simply not having the same individual appeal of Boris. His personal ratings are nearly identical to Sadiq – even on things he has been charging his Labour rival of, such as being “radical” and “extreme”. Gone are the days when Boris would beat Ken 50% to 13% on being “charismatic”. Without a personality advantage, the Conservative side is struggling to overcome the “natural” advantage Labour appears to have had in the capital in recent years. Labour won London at the General Election by nine points the same night it lost the nation by seven, it controls more than twice as many councils as the Conservatives in the city, and even when Boris was personally re-elected in 2012, Labour won the GLA election at the same time. Voting trends among different demographics have much to do with this. In the last Parliament, the Conservatives successfully crystallised themselves as the party for older voters – but the opportunity cost of focussing so much time, energy and public funding on this group in the form of the triple lock pension, “granny bonds” and support for house prices, has seen the Conservatives’ position slide amongst younger voters. This has therefore harmed them in London, with its much younger population than the country as a whole. Demographic change is also playing a part, the growing proportion of Londoners from BAME backgrounds creating a challenge for the Conservatives. Among white Londoners, Zac leads Sadiq 44% to 31% on first preferences, but amongst BAME voters, Sadiq leads by 36 points – even after Conservatives controversial leaflets targeting Hindu and Sikh households. 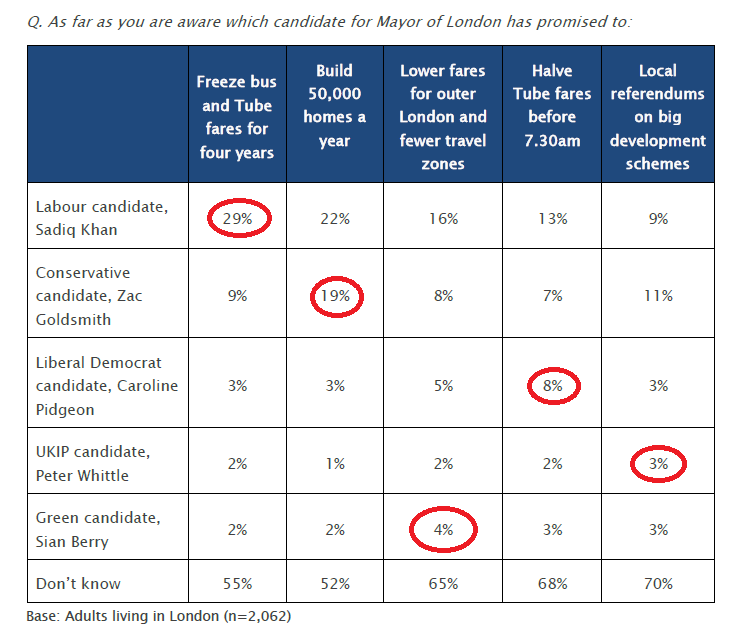 The intention of the leaflets on the face of it appears not necessarily to have been to persuade these groups to vote Conservative, but to disrupt Sadiq’s own campaign and reduce the desire amongst these groups to actually turn out and vote. Historically at mayoral elections however, BAME voters have been as likely to turn up to vote as white voters have. The Conservatives are also facing troubles with the other key part of Boris’s strategy: the “doughnut” - which appears to be crumbling. Sadiq is ahead in inner London, as might be expected (Sadiq: 49%, Zac 26%), but in outer London, the race is neck-and-neck (41% to 42%). Overall, this then leaves the advantage with Labour, and the Conservatives with all the work to do. Unfortunately for them, their policy offer does not appear to working at the moment – as the public are mostly unaware of it. When asked to identify key pledges from each of the main five candidates, the majority say they don’t know who is responsible for each of the different promises. Just 19% know that it is Zac who has promised to build 50,000. Facing an uphill battle on so many fronts has left Goldsmith relying on the one advantage he does have – that he has a working relationship with the Government. This is the one area in polling where he leads Sadiq significantly: 49% say he would be best at working with the national government, compared to 20% who say this of Khan. The Conservative campaign have duly taken this on board, putting it front and centre of their messaging. While it may possibly be successful in persuading people, it does however come with the downside risk that having attempted to present Londoners with a maverick, they instead end up with a candidate seen as a government stooge. As the Conservatives initially noted in Boris’s success, this approach has tended not to work in the past. Of course, historical precedent on this occasion is short – there have only been four previous contests from which to draw trends. Similarly, it is worth noting that mayoral polls have the potential to move quickly - the “leads” often reported in the press tend to be those from the two party run-off, after second preferences have been reallocated. There is nothing wrong with this, but the mayoral lead is not comparable to the “leads” in national voting intention polls because it necessarily has to move in twos. With just two candidates, if Sadiq drops from 55% to 52%, although he would only lose three points, the lead declines by six as Zac will have to have increased to 48% in counterpoint. For this reason, Sadiq’s current lead is smaller than it looks at ten. Nevertheless, it is his opponent that has all the work to do. On policy and personality, there is not sign – yet – that Zac Goldsmith is making up the ground. If he is going to catch up, it needs to happen soon.